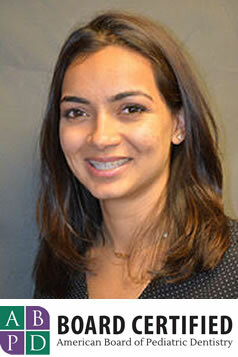 Meet our Pediatric Dentist, Dr. Namrata Hardy! Namrata Hardy is a Board Certified Pediatric Dentist who specializes in providing oral health care to infants, children, adolescents and individuals with special needs. Dr. Nam believes her role as a health care clinician for children is a genuine privilege and she loves watching her patients grow up before her eyes. Dr. Nam is committed to fostering these good oral habits from a young age. She loves empowering parents and children to take an active role in their oral healthcare. She believes every child is unique, and tailors her approach to meet their individual needs. Dr. Nam believes that positive dental visits from an early age, as well as regular visits to the dentist, are important factors in setting children on the right track to good oral health for a lifetime. Dr. Nam grew up in Michigan and the East Coast. She attended Michigan State University where she majored in Nutritional Sciences. She completed dental school at Tufts University in Boston, where she met her husband. She then went on to specialize in Pediatric Dentistry at Brookdale Hospital in NYC. Her husband, Dr. T. C. Hardy, convinced her to move to his home state of Colorado, where they now live with their 6-month-old baby boy. Dr. Nam is a Diplomate of the American Board of Pediatric Dentistry, a member of the American Academy of Pediatric Dentistry, Colorado Dental Association and the Metro Denver Dental Society. In her spare time, Dr. Nam loves to cook, ski in the winter, hike in the summer and spend time with her growing baby boy. Dr. Nam loves kids! She will work on a relationship built on trust between you and your child in order for your child to feel safe and cared for. If your child needs dental treatment, we request that you stay positive before and during the appointment! Children can sense the energy and anxiety that you give off and it can transfer to them, which can make for a more difficult experience. We avoid using words such as “shot”, “drill”, “needle” and “pulling teeth”. Instead, we use words such as “sleepy juice”, “whistly toothbrush”, “Mr. Thirsty”, “Tooth Counter”, and ”Wiggle your tooth”. Dr. Nam and her staff also use a technique called “Tell-Show-Do”. We first “Tell” your child exactly what we will be doing, then “Show” it to them on their finger or by modeling, then “Do” the procedure. Children do much better when they know what to expect and the fear of the “unknown” is addressed. Dr. Nam believes that parents play an active role in their child’s oral health, and that includes during their dental visit. Parents are encouraged to come back during treatment to provide emotional support. However, if you are nervous, please be aware that your child may sense that from you and it may transfer to him or her.